Place in Paradise - Kailua offers casual oceanfront accommodations on one of the most beautiful beaches in Hawaii. Kailua Beach has been voted "Best Beach in the United States" by a variety of publications. 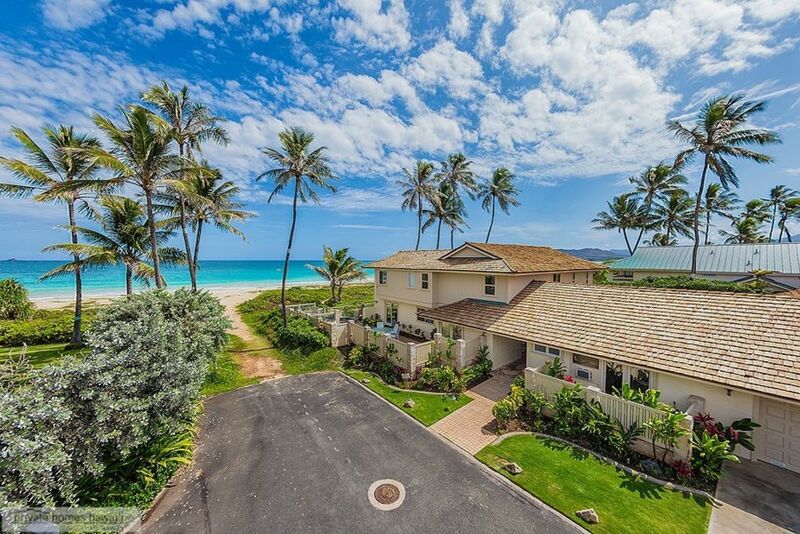 Five bedrooms and five and half baths make this an ideal home to enjoy on your next Oahu visit. Large outdoor deck spaces provide the perfect place to relax in the sun or enjoy a barbecue while taking in the breathtaking views of the Bay. Kailua Beach offers 3 miles of fine, soft white sand along a crescent shaped bay bordered by clear turquoise waters which have a consistent year round temperature of about 75 degrees F (25 C). The steady off shore trade winds, water temperature and protective reef make this bay a popular area for all sorts of water sports including Kayaking, Stand-Up Paddling, Surfing, Boogie Boarding, Swimming and Kite Surfing. The home includes a fully equipped kitchen with new, updated counter tops and appliances. A large living area features picture windows facing the sea in addition to a comfortable media room for entertainment. AC in all bedrooms, Cable TV in family room and in 4 out of 5 bedrooms, beach towels, Jetted Tub in 1 Bathroom, Tennis (shared), Garage for 2 cars, (parking for 4 total) Charcoal Grill (BBQ), Housekeeping Service, Babysitting, Concierge Services available. We have now stayed at &#x201C;A Place In Paradise&#x201D; five times, lastly for 31 nights. It is perfect for a family group visit, or a private hide away for two. Perfectly located at the quiet end of Kailua Beach with the trade winds blowing in from the beach onto a private lanai. A perfect spot for a snooze in the afternoon! Thank you John - always great to have you back in Kailua. Glad you enjoyed yourselves and looking forward to seeing you again. Steven and Jeremy. Return, Return, Return- Repeat, please! We have made this PLACE IN PARADISE a yearly tradition (for many years) and plan to continue doing so- for our son's birthday. We invite several guests and everyone has room to be together and also room for some solitude. Steven and Jeremy have made lots of nice upgrades and continue to do so, keeping in mind that being ocean front (elements) are harsh on everything. The house is very clean and they have thought of simply everything that you could possibly need, to enjoy time at a BEACH HOUSE. We have recommended to friends and will continue to do so. RAVE REVIEWS! The photos are not deceiving- house looks exactly as pictured; lovely! Thank you as always for your kind words. Look forward to having you and family back again in 2020! We had the best time! The house was perfect for our large group. It was clean and well kept and spacious. We loved being able to walk right down the short path to the beach. Also appreciated how well stocked the home was with beach chairs and beach items. Would love to come back!! Thank you - would love to have you back! We appreciate your business and kind review. we spent a week at this wonderful home and it could not have been better: location, right on a perfect beach, spacious home, clean and well prepared for guests with beach toys, games in the home and televisions for those who could not miss a sporting event. Near to good restaurants and places to get surf lessons, rent bicycles and surf boards. If we are fortunate enough to return to Hawaii again with our large family, this property will be at the op of our list of places to stay. Thank you for your review. It was nice to have you and your family with us for the Holidays and we hope to have you back again soon. The location was excellent and the place was just as described. The guys showed us around and then left us to enjoy our week. Made heavy use of the grill and the outdoor furniture. Beds were very comfortable. Would highly recommend staying here!!! Thank you Jim - we hope to have you back again soon! Our stay couldn't have been more perfect!! Steven took such good care of us in every way! !The house fits our family to a "T"!! It is always clean, well equipped from kitchen to beach fun to bathroom needs to beautiful furnishings!! The location couldn't be better!!! It will be the same house for us next time!!! Thank you Leslie and great to hear you all enjoyed. Look forward to having you back with us again soon at Place in Paradise! Jeremy & Steven. Shared privileges of the Hale Kai Surf & Racquet Club - swimming pool, tennis court, paddle ball court, club house. Popular Kailua Town is just two miles with many restaurants and boutique shopping.